Walking Iris Plant Care - Neomarica spp. 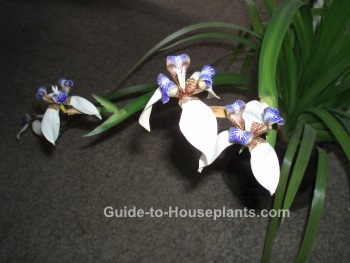 Walking Iris is a rare house plant, but it is puzzling why. 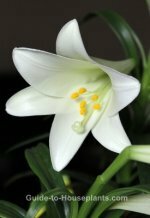 This beautiful bloomer has an easy-going nature and will bloom dependably in late winter to early spring (March-April in the Northern Hemisphere). Neomarica spp. grows in a clumping fan of long, strappy leaves, making this an elegant plant even when not in bloom. However those blue-and-white flowers that appear every year are simply stunning -- and delightfully fragrant. 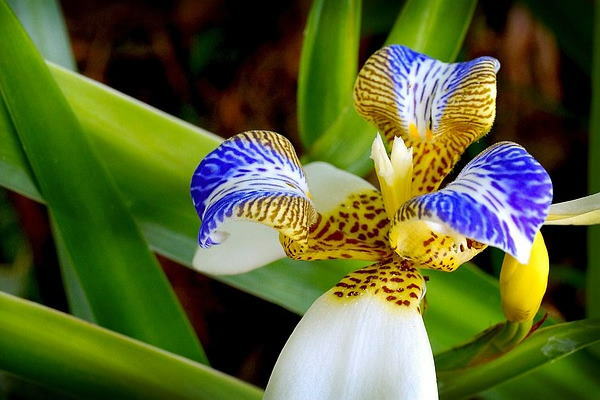 Three large petals are held horizontally, while three small contrasting petals are curled. Although the flowers are short-lived (often lasting a day) you'll enjoy a succession of blooms. This tropical member of the Iridaceae family gets its common name from its unusual propagation habit. New plantlets grow at the tips of the flower stems, weighing them down until they bend to touch the ground and take root. The new plants will eventually repeat the process, causing the iris to "walk" across the garden. Not all Neomarica species walk -- N. caerulea has sturdier stems that stay upright. Several species exist. Among the most popular, Neomarica gracilis and N. northiana sport large white petals with brownish-red, tiger-striped patterns and bright-blue curled petals. N. caerulea has violet-blue petals. Keep in mind Neomarica is tropical. This South American native thrives in bright locations, shaded from direct sun. Keep it warm, too, year-round. Repot in spring, only when the plant gets too crowded. It thrives in a small container and blooms best when pot-bound. Just be sure to use one with drainage holes to prevent soggy soil. If you've never grown Walking Iris, give it a try. Growing it indoors is easy and soon you'll have lots of plantlet "babies" to share with friends. Light: Bright, indirect light or partial sun. Water: Water generously throughout the growing season, keeping the soil evenly moist. Humidity: Average room humidity (40-50% relative humidity). Indoor air can become extremely dry in winter. Use a cool-mist humidifier to maintain humidity around this tropical plant. Temperature: Average room temperatures 60-75°F/16-24°C. Walking Iris is hardy in USDA Zones 9-11. You can scoot your container outdoors for the summer, if you want -- just keep it in full shade outside. Soil: Rich, humusy potting mix amended with coarse sand for good drainage. Fertilizer: Feed every two weeks in winter (December-January) with a high-potassium liquid fertilizer.